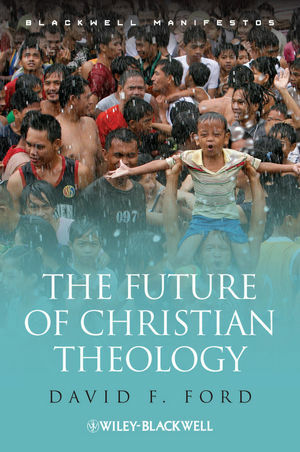 The Future of Christian Theology represents a personal manifesto from one of the world's leading theologians, exploring the ways Christian theology in the twenty-first century has been, and can now continue to be, both creative and wise. Offers an insightful description of what makes for discerning and creative theology. A hopeful and illuminating search for wisdom and understanding in the increasingly complex religious and secular world of the twenty-first century. David F. Ford is Regius Professor of Divinity at the University of Cambridge. He is the author of numerous books, including Christian Wisdom. Desiring God and Learning in Love (2007), The Shape of Living (2002), Theology: A Very Short Introduction (2000) and Self and Salvation: Being Transformed (1999). He is also the Director of the Cambridge Inter-Faith Programme. 1 A Cry for Wisdom: Theology for the Twenty-first Century. From the Twentieth to the Twenty-first Century: Theological Abundance and Variety. Four Elements of Wise Creativity. 2 Drama in Bible, Theology, and Life. The Bible: More Dramatic than Epic or Lyric. Gospel of John – Epic, Lyric, and above all Dramatic. Intensity and Extensity in the Ongoing Drama. Conclusion: Drama, Wise Theological Creativity, and an Unanswered Question. 3 A Dramatic Code for Twenty-first Century Theology. Modern Secularity and the Health of the Public Sphere. A Drama-centered Account of Modernity. A Dramatic Code for Theology Today. Conclusion: Within and Beyond the Drama. A Balanced Dynamic of Theological Moods. Between Closed Religion and Wide Open Religion. Theological Moods in Bible and Tradition. God-centered Moods: The Divine Passive. 5 Belonging: Church, Collegiality, Conversation. Belonging to God and Each Other through Covenant. Theological Creativity in and for the Church. Learning and Teaching Together: Collegiality. Intensive Belonging: Cohabitations, Collaborations, and Movements. First Case Study: Dietrich Bonhoeffer. Contemporary Case: Theological Tasks for the Church in Democratic Civil Societies. A Jewish Blessing: Dabru Emet. A Muslim Blessing: A Common Word. Scriptural Reasoning as "First Inter-Faith Theology". Seeking Wisdom for Inter-Faith Engagement: A Muscat Manifesto. 8 New Theology and Religious Studies: Shaping, Teaching, and Funding a Field. What is New Theology and Religious Studies? The Global Potential of New Theology and Religious Studies. 9 Becoming a Theologian: The Apprentice. Retrieval – A Receptive, Reading Self. Engagement – A Loved and Loving Self. Thinking – An Imaginative, Discerning Self. Communication – A Witnessing, Poetic Self. 10 The Bible: Creative Source of Theology. How the Bible Has Shaped This Manifesto. What Sort of Bible Reading is This? The Four Elements of Wise and Creative Theology in the Bible. A Biblical Hope for Twenty-first Century Theology.